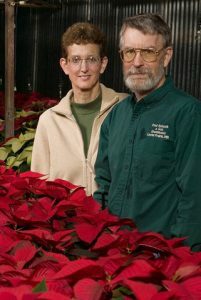 Fred Holasek and Son Greenhouse was started 40 years ago by Fred W. Holasek. After working for another greenhouse in high school, he started his own business on the corner of County Road 6 and Highway 12 in Long Lake, Mn. He purchased the Lester Prairie Minnesota property in 1978. Lester Prairie is located approximately 30 minutes West of the Twin Cities Metro area on State Highway 7. We currently have over 70,000 square feet of greenhouses. Family members have always been involved in the greenhouse. His mother, father, and siblings all helped one way or another to get his business going. 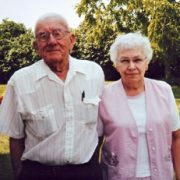 Jane Holasek, Fred’s wife began as part-time in 1986 and moved to full-time in 1995. Growing up both sons Alan and Jay Holasek helped at the greenhouse while not in school. Jay has now returned to work at the Greenhouse after completing his Bachelors degree in Horticulture. Wholesale and retail sales have always been part of the business. Our trucks deliver to professional gardeners and small, high-end garden centers that are locally owned within an hour’s radius from Lester Prairie. Our biggest and busiest season is spring, when our 30 employees work to provide our customers with the best quality and most unusual annuals anywhere! In summer, we grow a large crop of assorted annuals and start the poinsettia crop for Christmas. We grow over 20 varieties of pumpkins and gourds in our fields out back during the summer for fall sales. Other crops also grown in summer for fall sales include ornamental cabbage and kale. When November comes, we’re ready with spruce tips, outdoor greens, and thousands of poinsettias for seasonal decorating. There’s always something growing at Fred Holasek and Son Greenhouse! Fred Holasek & Son Greenhouse has installed 48 solar panels! All systems are American-made, and provide us with clean, renewable energy and lowers the demand for electrical companies. Holasek is a 2017 Proven Winners® Certified Garden Center. Through the iGarden program, the owners and employees are provided with plant selling tips, customer service tools and merchandising techniques to help them better serve consumers in helping them select and grow the right Proven Winners plant varieties for their individual gardening needs. As a 2016 Certified Garden Center, Fred Holasek employees successfully completed a video training program and test, which evaluated their plant knowledge, customer service skills and merchandising techniques. This comprehensive training program includes demonstrations and recommendations on how to enhance a customer’s experience at every touch point-from the layout of their store to answering questions about plant performance, characteristics, and care. According to Marshall Dirks, Director of Marketing for Proven Winners, “A knowledgeable sales staff increases the chances consumers have for success with their plant purchases. Through the iGarden program, Proven Winners can provide employees the resources they need to become an invaluable asset to their customers.” They also receive a free pizza party for all their hard work! Proven Winners is an international marketing cooperative comprised of some of the world’s best propagators. As a group, they are dedicated to developing new hybrid color varieties that will perform well for both the grower and consumer. Proven Winners plants are found in more than 5,000 retailers nationwide. For more information about Proven Winners and Urban Greenery, visit www.provenwinners.com.